I think 8 or 9 am on the weekend. It's still early enough to annoy the crap out of the crappy neighbours while not annoying the good neighbours who also suffered along with you. Yep finished about 30 mins ago. Start a chain reaction in the street though, there's at least 3 others mowers going now. -PJ- wrote: Yep finished about 30 mins ago. Haha. The absolute worst thing about living in NY was apartment living. Drove me insane the complete disrespect that some people have for their neighbours. When the fifth party happened in the apartment above me, in the space of 2/3 weeks I went upstairs, banged on the door and told him to pipe down. He was shocked and so were the doormen. "You can't do that, you have to come tell us and we contact them". Fuifui Bradbrad wrote: So I’ve been building these modular garden beds from Birdies. They’re like a flat pack, you give them the dimensions and they send you the timber. Beds are in multiples of 550mm, so you can have them 550m long, 1100 long etc. So I ordered them, and have planned to basically build a giant horseshoe around the backyard. Thinking I’ll have about 200mm wriggle room on both ends when I’m done. Get to the last piece, and there’s a 430mm gap between the bed and the fence. Not too sure what to do. These things are heavy, so moving them around is a bit of a pain. I have 100mm on the other side as well, so ordering another piece isn’t an option either. Looks really good Fui. Do you mind sharing how much that was, I think that looks about as much as I'd need along my back fence. What are you going to plant in there? 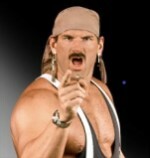 He's planting some stuff for Manbush !!! BTW that's looks great Fui..
gergreg wrote: Looks really good Fui. Do you mind sharing how much that was, I think that looks about as much as I'd need along my back fence. What are you going to plant in there? Yeah it was around $2k - $2.5k by the time I was finished. It was relatively easy. The hardest part was priming and painting. Plant wise, we’re going for a tropical look. Ferns, Palms in those towers, frangipani. We were inspired after we went to Hawaii. Yeah will do. Spoke to Mrs Fui, as she’s the site foreman. Pointed out that we can plant some taller palms in the gap. Plus we have space to put some decorative screens on the fence too. We’re going for a Tropical style look. Lots of greens, ferns, palms etc. I kind of like the clean look of these low retaining walls. The 'charcoal' Windsor (near the bottom) would work nicely at my place with matching charcoal pavers would look really professional. I have to fix the back fence first though and as with everything it comes back to finances, or lack thereof. Yes looks nice, you got a ball park figure? I've probably got about 6/7 metres worth of wall/garden to do? Can’t remember the length, but we got about 80 blocks in the end. Worked out cheaper to get a pallet. Thanks Dubs. It was more luck than anything. 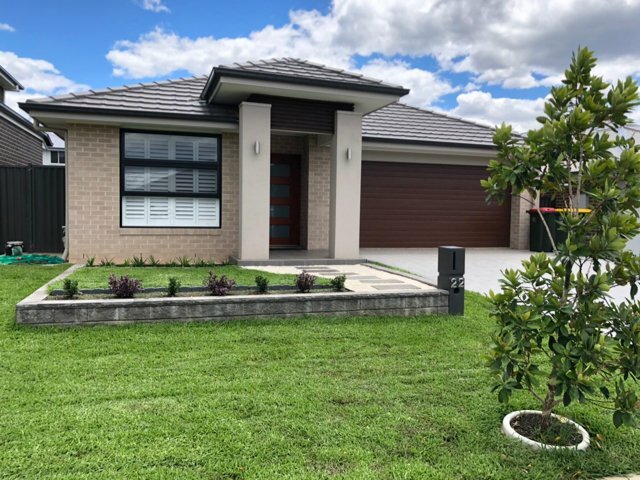 When we bought the block, it was cheaper to build our house than buy one to the same specs. It’s flipped now. 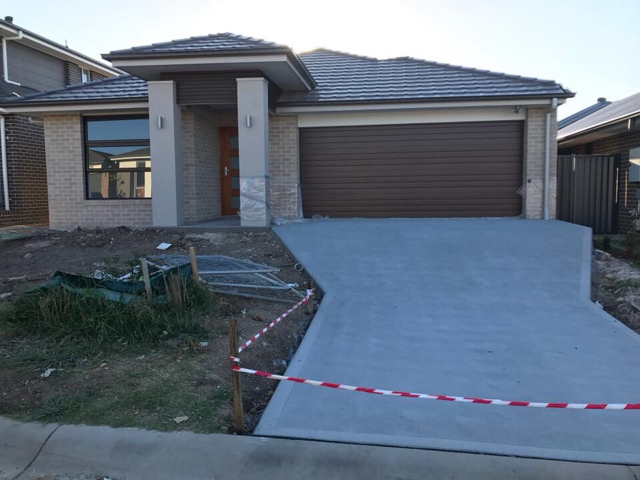 It also helped that the developer took nearly 18 months to register the land, so we used that time to save like crazy living with the in laws. No way we could do it now. Fuifui Bradbrad wrote: Yeah will do. Spoke to Mrs Fui, as she’s the site foreman. Pointed out that we can plant some taller palms in the gap. 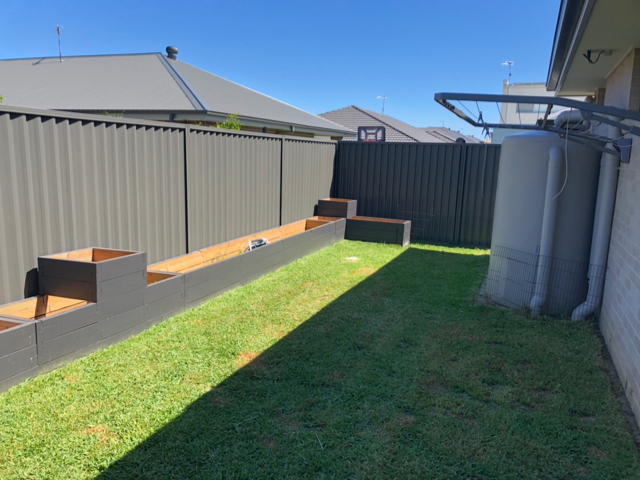 Plus we have space to put some decorative screens on the fence too. Looks really good Fui. Probably can't afford to drop 2k atm but will keep it in mind for the future. 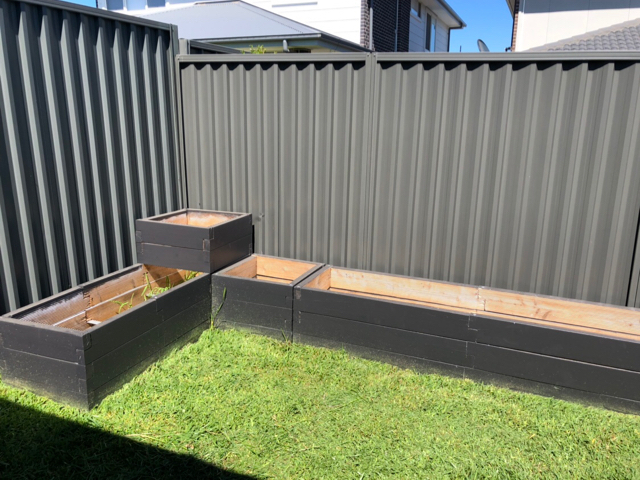 A few Qs though; you mentioned painting - I didn't realise these would be a product that required painting which is a little annoying as far as semi-regular upkeep; and secondly I can't tell from your front yard pics whether the structure is boxed or just a single row of the blocks? Do you need to box it to maintain its integrity or can you just use it in a singular line? 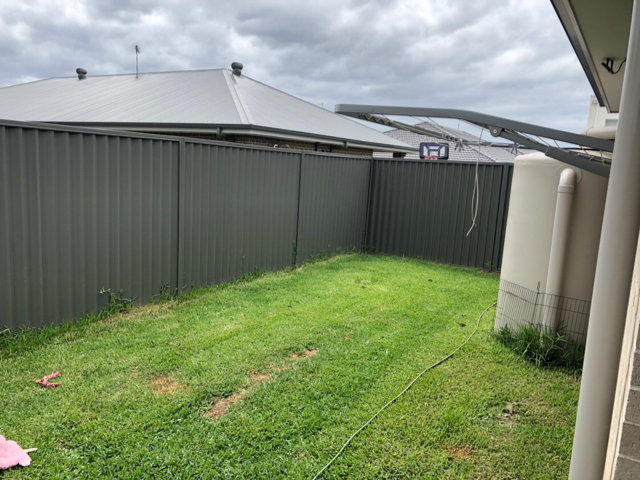 I ask partly for minimising cost and also future maintenance - if you place a boxed version up against a fence how do you re-paint the side which is up against the fence? 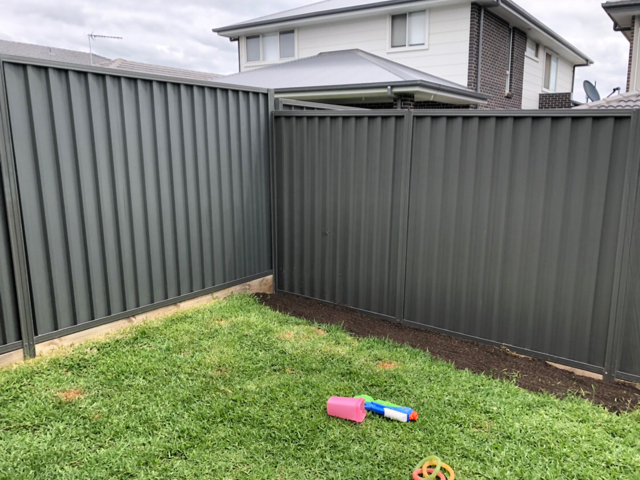 I hear you saying, why the hell would you even bother - but our body corporate has a strict design feature (hardly a feature Imo) that there needs to be a gap in our fencing (between each pailing). 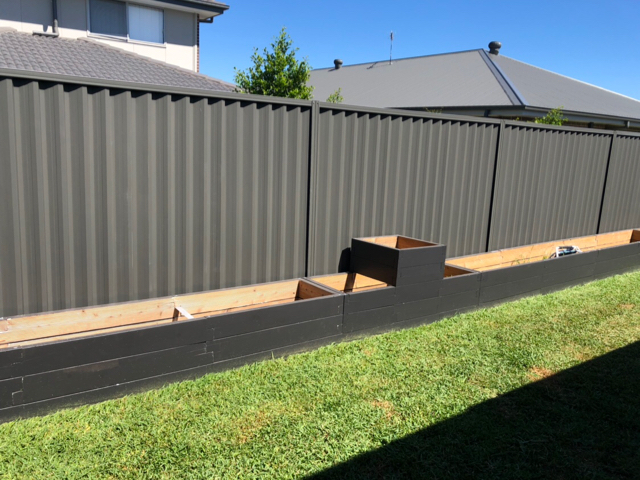 Again looks great and I'd love to see a pic of the final product (along your fenceline). For painting, it was personal choice. We just thought painting them grey rather than leaving them as raw pine suited our house and the look we were going for. NSW premier Gladys Berryjiklian was in Newcastle today to officially open the light rail..
She's single ya all know !!!!! Q we have builders plastic we’re going to line the inside with before we lay the soil. Question wrote: Yeah it helps... should be enough mate. Looks good by the way throw a few bird of paradise in the mix mate. Great minds mate, we got 2 yesterday. Thanks, we’ve just finished off the plant buying. Got some Frangipanis, Tropicana Gold, Dragons Breath, Crotons, Cascade Palms and Elephant Ears. Now to keep them all alive! I've been a little off the last few days. Broken sleep, headaches, lower leg pain(torture). I spend all day on my feet and at the end of my shift my feet are killing me. I've tried the inserts in my boots and they're OK for a while until they start to wear. I'm just exhausted as well and I've never been the type of bloke to sit around, but lately I've got home from work and done squat for a few hours. I've been drinking heaps of water so hydration shouldn't be a problem. Peej mate the heat has knocked me about too. Looks like I've sold my house after 4 months on the market, agreed a price on another that will need renovations. PJ... I drove back from Sydney on Saturday morning and stood watching the junior reps all afternoon... I was a tired old bloke at the end of the day. Sore eyes, a bit sunburned, despite doing the right thing as best I could. You're doing well to stand up all day every day for work. My aching feet are keeping me awake. I've been soaking in Mrs PJs foot spa as well as using Radox. I've been sleeping half way down the bed, on my stomach with my feet hangin over the edge of the mattress. Maybe I need more salt in my diet. I'm just real lethargic and busted. I'll go to bed tonight and by the time my alarm goes off at 5am I'm feeling ok..probably 80-85%. By the time I knock off I'm sore. Thank god a drive an auto. Staying in the Nock bone ?? yes mate, Rothbury at least. I'm working behind the supercentre these days so commute will be better. Might give that a go !!! Are you getting this rain right now ? For the feet have you tried Peppermint Foot Spray from Body Shop? Its no miracle cure but does a decent job of temporarily refreshing the feet. Haven't tried that mate. I actually swapped boots today, put the slip ons back on. Their issued, good quality..SteelBlue? But I'm wearing thinner socks as well.. Today I'm not too bad. I suppose standing up all day will eventually start to break a man down.. I like being home..bare feet..relaxing to be honest. The 2019 season guide is out. Big League mag, all glossy, all clubs, $10..
this stop start cricket season I've struggled with cramps and pulled muscles in the legs, magnesium tablets have done wonders. Woeful season, 17 runs at 3.7 only batted on raging greentops coming in on the back of top order collapses, 5 dropped catches from 6 chances, 2 broken ribs, 2 broken fingers.